1991 black blanket stallion. Excellent halter stallion. Bloodlines include Money Creeks Monte Time and Absarokee Sunset. Bred by Persimmon Hill. 1991 chestnut leopard stallion. Photo show placed. Bloodlines to Doc O'Lena and Shylocks Cody. Bred by Rivendell Acres/Holly Buck. 1994 red dun blanket stallio. Live show winner. Bloodlines to The Executive, Dial Bright Too and Mighty Bright. Bred by Cindi Nakagawa/Indigo Creek. 1995 bay blanket stallion. Live show Champion, photo show champion. Excellent bloodlines with crosses to Goer, Joe Twist and Wapiti. Bred by Painted Pony Ranch. 1998 buckskin no spot blanket stallion. Limited showing, bloodlines to Skipa Star and Prince Plaudit. Bred by Painted Pony Ranch/Eileen O’Dell. 2000 black blanket stallion. Photo show winner. Bloodlines trace to Wild Zip, Night Deck and The Investor. Bred by Rivendell Acres/Holly Buck. 2004 black leopard stallion. Currently unshown, bloodlines to Cajun Prince and Northern Sunset. Bred by Green Mountain Stables/Heather Mays. 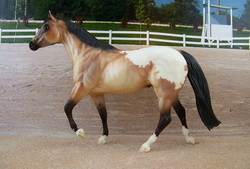 2007 dun blanket stallion. Limited showing, bloodlines to Northrn sunset 2x, Prince Plaudit 2x and Joe Cody. Real time bred Foxfire foal so has a permanent foal body. 2007 roan blanket stallion. Limited showing, bloodlines to Genuine Gold, Goer and Mighty Rustler. Real time bred Foxfire foal so has a permanent foal body." 2007 chestnut blanket stallion. Unshown, bloodlines tracing to Hayes roman Cloud, Mighty McLoud and First Secretary. Bred bu Foxfire and Kay Myers/Caballos Del Mar. 2011 black blanket stallion. Excellent show colt, bloodlines to Wild Zip and Night Deck. Real time bred Foxfire foal, so has a permanent foal body. Spider, Prince Plaudit, and Wapiti. 1989 black blanket mare. Very much a hunter type mare, dam is TB. Live show placed. Bloodlines include The Ole Man, Dancers Image and Pleasant Colony. Bred by Painted Pony Ranch. 1991 Bay Blanket Mare. Live show placed and photo show halter Champion. Lines to Skip Bright, Prince Plaudit, and Classy Bar. 1991 palomino blanket mare. Unshown, excellent lines including Bright Eyes Brother 2x, Sugar Bars and Jay Page. Bred by Double Hart Ranch. 1991 black blanket mare. Unshown. Lines include Bright Eyes Brother, Mighty Rustler and High Hand Man. Bred by WMHS. 1991 black leopard appaloosa mare. Unshown, bloodlines to Prince Plaudit, Bright Eyes Brother and Mr Impressive. Bred by Thundervalley Farm. 1993 bay blanket Appaloosa mare. Unshown, bloodlines to Waps Spot II, Sir Wrangler and Go Bay Go. Bred by Thundervalley Farm. 1993 Bay blanket Mare. Live show placed, and excellent photo shower. 1996 black leopard Appaloosa Mare. Unshown. Excellent lines including Goer and Bar Depth. Bred by Sweetwater Ranch. 1997 red dun blanket mare. Unshown, nice bloodlines tracing to Hollywood Dun It and Dreamfinder. Bred by Ber Ali Farm. 1997 bay varnish roan mare. Limited showing with good results. Bloodlines to Skip Bright, SEF What's Up Doc and The Executive. Bred by Cory Hartung/Double Hart Ranch. 1997 bay blanket mare. Limited showing, good results. Bloodlines trace to A touch Of Blue, Three Chick's Snowcap and Leo Jack. Bred by Cory Hartung/Double Hart Ranch. 1998 grulla blanket mare. Champion show mare, excellent modebred and real pedigree tracing to Dial Ten, Mightly Magnetic and Fourmiles Stormy. Bred by Cory Hartung/Double Hart Ranch. 2001 black blanket mare. Photo show winner. Mostly model bred. Bred by Rivendell Acres/Holly Buck. 2001 chestnut blanket mare. Limited showing with excellent results. Bloodlines to Skip Bright, Doc O'Lena and Tabasco Tivio. Bred by Cindi Nakagawa/Indigo Creek. 2002 bay blanket mare. Limited showing with excelent results. Bloodline to Steel Impression, Goer and eternal Valor. Bred by Randa Garrett/Twin Springs Stables. 2003 bay blanket Appaloosa mare. Unshown, nice modelbred pedigree! Bred by Randa Garrett. 2007 bay blanket mare. Limited showing, bloodlines trace to First Secretary, Hayes Roman Cloud and Skip Bright. Real time bred Foxfire foal so has a permanent foal body. 2007 bay blanket mare. Limited showing, LSP. Bloodlines trace to Prince Plaudit and Northern Sunset. Real time bred Foxfire foal so has a permanent foal body. 2007 buckskin blanket mare. Limited showing, mostly model bred pedigree. Real time bred Foxfire foal so has a permanent foal body. 2008 bay blanket mare. Limited showing, good results. Bred to be an all-around horse! bloodlines to Mighty Rustler, Bright Eyes Brother and High Hat McCue. Real time bred Foxfire foal so has a permanent foal body. 2008 buckskin blanket mare. Unshown, excellent bloodlines. Bred by Linda Ransom/Trumpet Farms. 2010 bay blanket mare. Champion halter horse, bloodlines tracing to Skips Reward, Upper Classman, Prince Plaudit and Classy Bar.